Thank you to Bed Bath & Beyond for partnering with me on today’s post. As always, all thoughts, opinions, and product selections are my own. Click here to read my full disclosure policy. Kurtis and I have been in need of new dishes. Our old white ones just didn’t seem to be getting clean any longer. Not only that, but over the past decade we’ve owned them, we’ve managed to break a handful and we were running short on several of the plates. I wanted something nicer than we had in the past, but also something that didn’t feel overly fancy and would be great for everyday use. I also knew I wanted to stick with all white, simply because it’s so versatile and works year round! I ultimately ordered the Olivia & Oliver Harper Organic Shape Dinnerware Collection, which is found exclusively at Bed Bath & Beyond. I fell in love with the sleek organic texture and knew it would be perfect for us! Today I want to show you just how versatile the Olivia & Oliver line is. 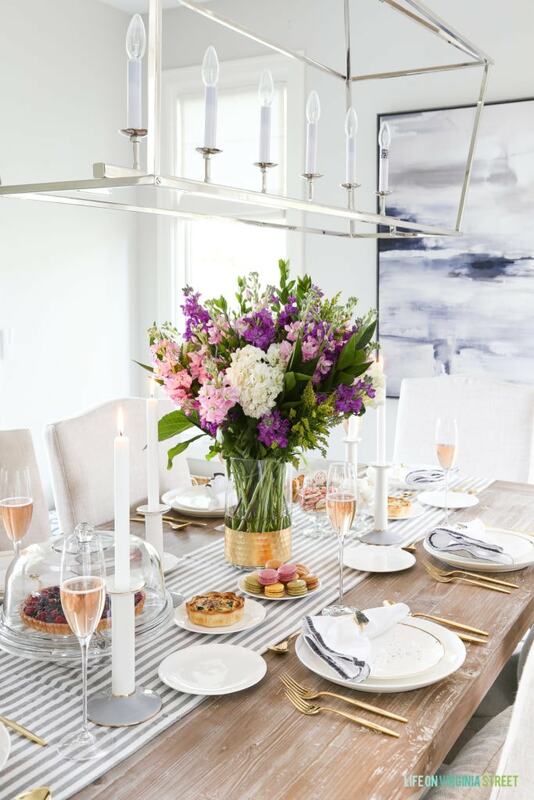 Although it falls in the “china” category, I also wanted to demonstrate how it can easily transition from a casual brunch to a much more formal get together! 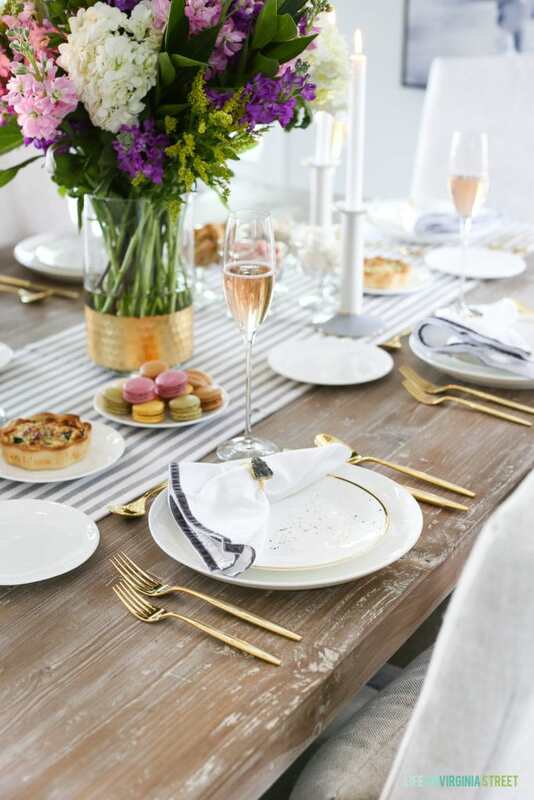 So, I’ll be sharing one place setting and serving pieces, styled two completely different ways! 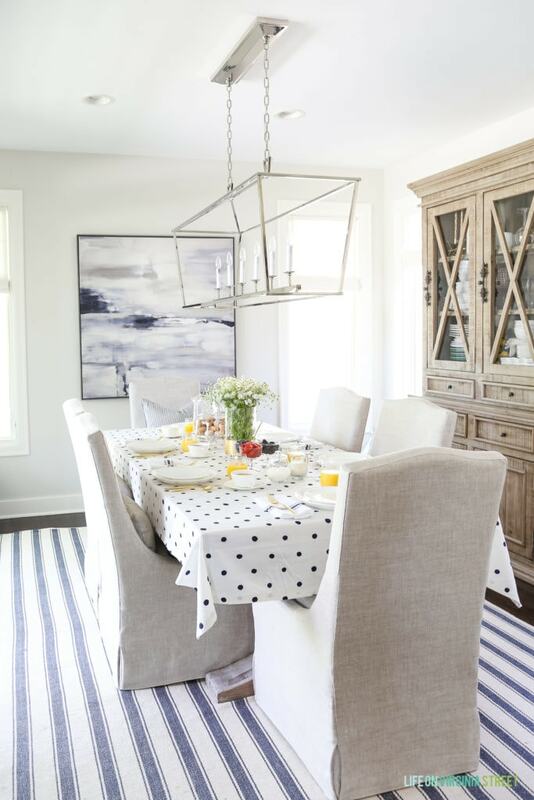 In the summer months, it’s not uncommon for us to host breakfast at our home frequently. We tend to have overnight guests on the weekends (pool perk) and our breakfasts tend to be fairly casual. 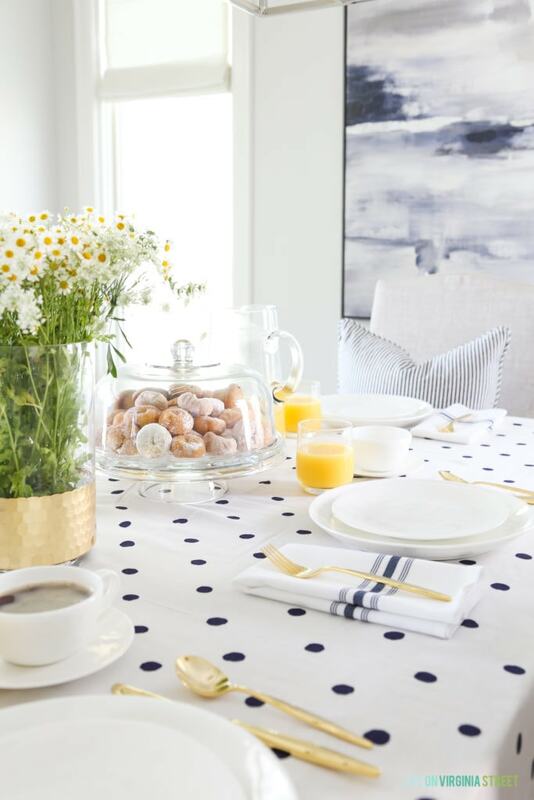 I had honestly never used a tablecloth on our dining room table before, but after buying this Kate Spade polka dot tablecloth, I’m a total convert. 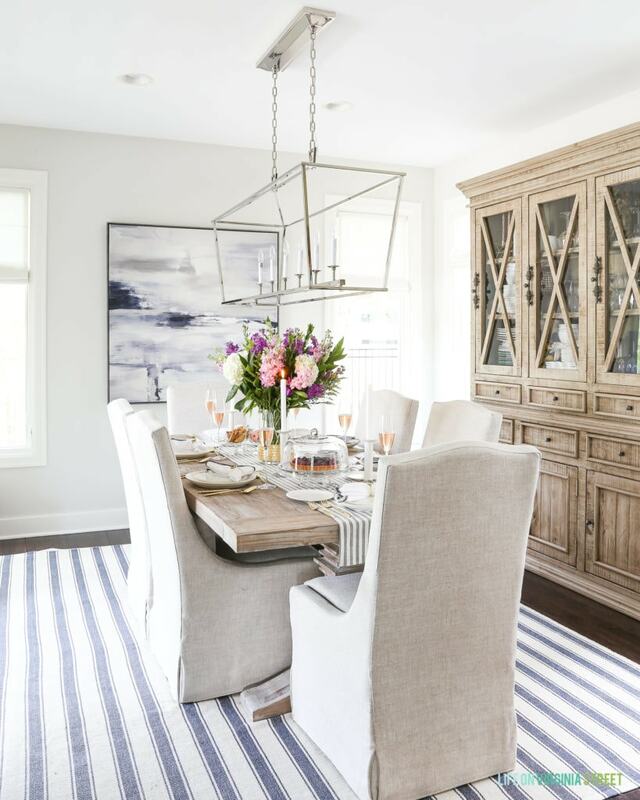 Not only did it set the stage for my coastal-inspired tablescape, but it’s highly functional and helps protect our porous table from food and spills. It’s basically the cutest thing ever. For the more casual brunch, I used a portion of the Olivia & Oliver Madison 5-Piece Flatware Set in Gold. It also comes in silver and a chic matte black! By just using three pieces from the set, it’s much more fitting for a casual breakfast at home! I also scaled back the dishes used from the Olivia & Oliver Harper Organic Shape Dinnerware Collection. You can see the dishes have a slightly rippled effect and I love the way they bounce light! I’m ridiculously obsessed with this cake dome. Not only is it just a cake dome, it can convert to a punch bowl, covered crudites with dip server, hors d’oeuvres plate with dip server, salad bowl with vegetables underneath, and simple pie or cake plate. What?! It would make such a fun gift because it is so versatile and is super solid and strong, and it’s really affordable. It should also come as no surprise that I’m in love with these bistro striped napkins. I love that they are durable and oversized, and totally fit in with my coastal style! This gold hammered hurricane works perfect as a vase for a floral arrangement. 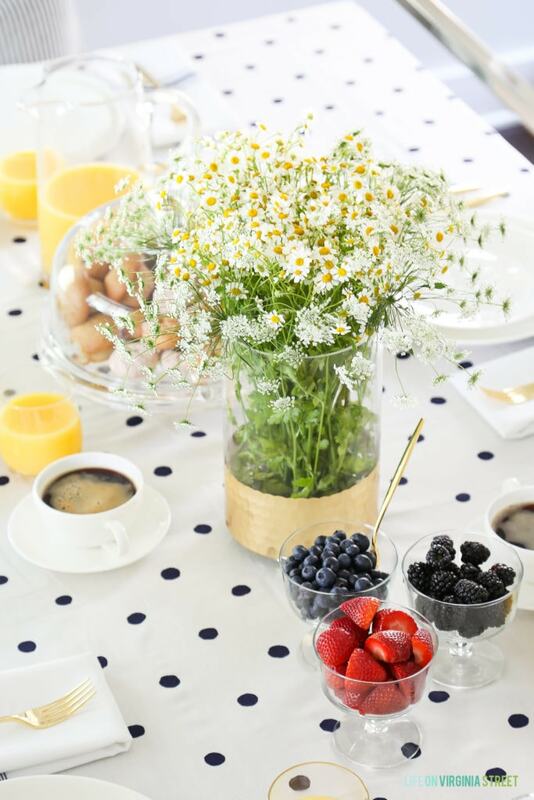 I kept it simple for this casual brunch, and allowing the arrangement to be pretty organic and un-fussy. On two separate trips this year, our hotel rooms had Nespresso makers and Kurtis and I became obsessed! So we added it to our wish list and recently bought this one. We love the espresso it makes – and I know our guests will too! The small glasses in this set are perfect for juice and other drinks when you’re also serving coffee. 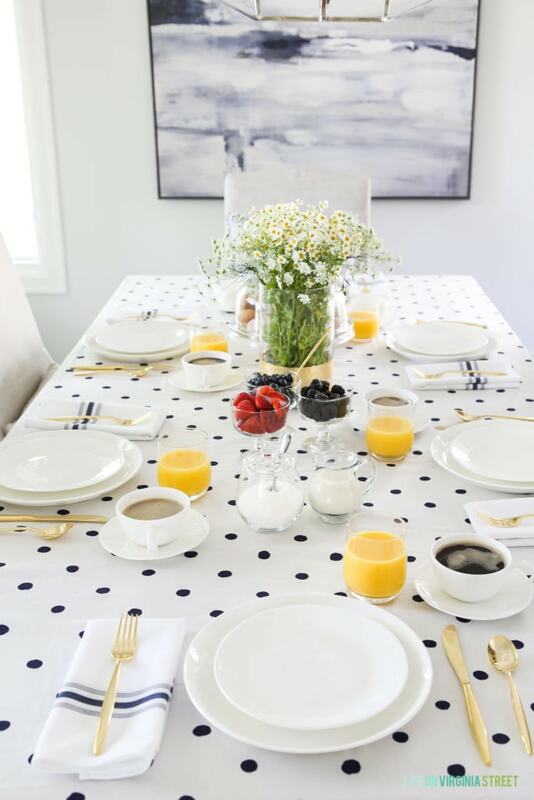 By keeping the details simple and the tabletop uncluttered, a simple brunch can still be beautiful and look pulled-together. Next I wanted to demonstrate how beautiful the Olivia & Oliver collection can look in a more formal setting. 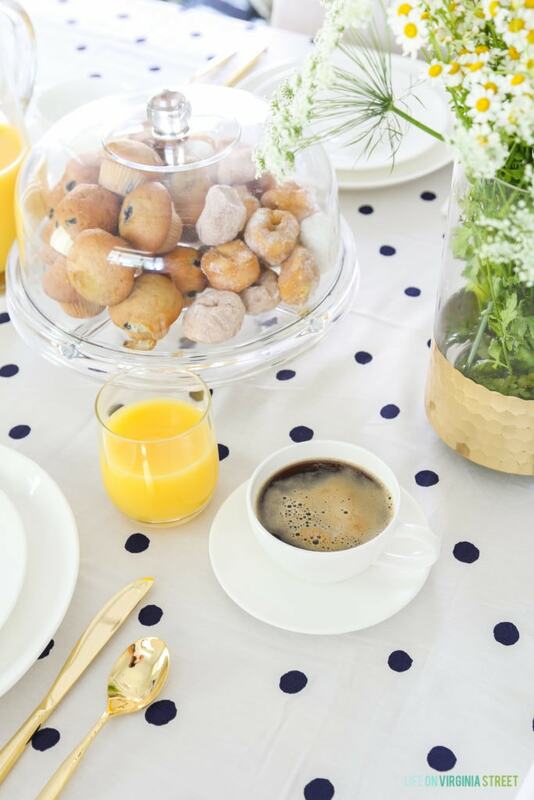 This time, for a formal French-inspired brunch that would be perfect for a shower or get together with your girlfriends! I started by layering this shimmer striped runner on the table. Then, by lighting these candles in these beautiful Kate Spade candlesticks, the scene instantly became more glamorous and fancy! I filled the same gold honeycomb hurricane with flowers, but this time with a bit more dramatic of a floral arrangement! In both tablescapes though, I just used loose bunches of flowers from the grocery store to make the arrangements so both were reasonably priced! 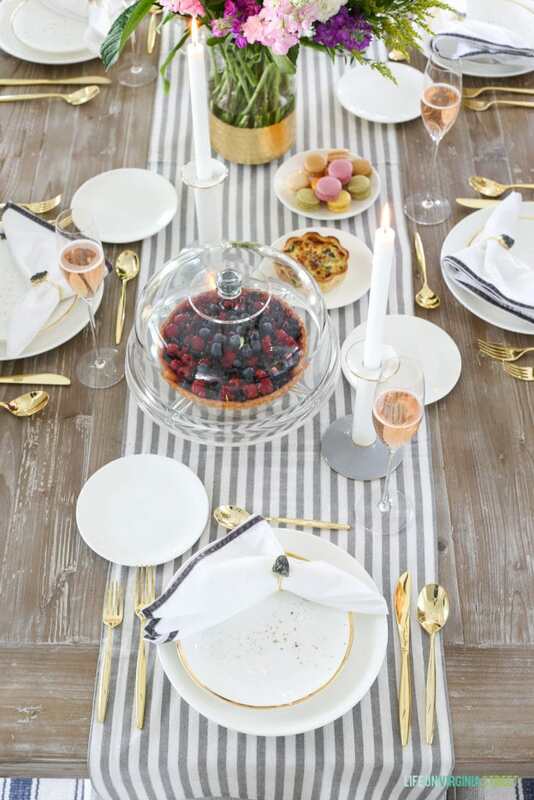 I used the same Olivia & Oliver Harper Organic Shape dinnerware, but also included these gorgeous gold splatter salad plates from the same collection. 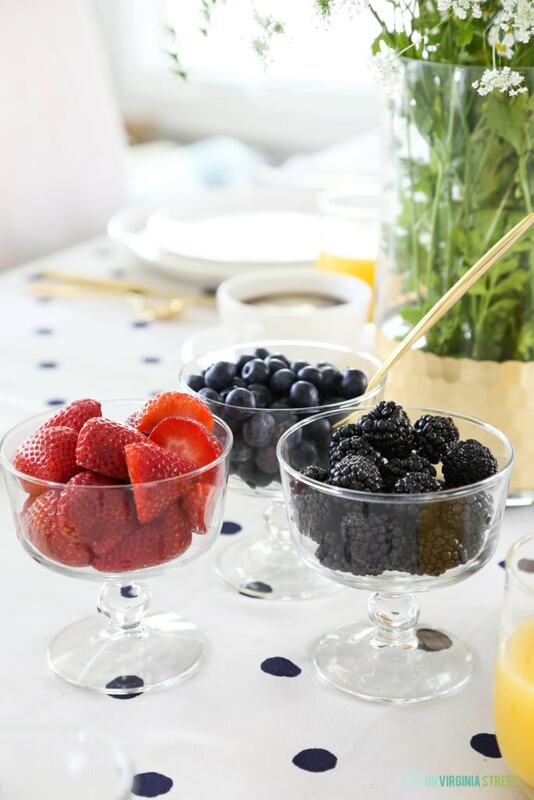 They add a touch of whimsy and sparkle, perfect for this more formal brunch! I think they’ll also be beautiful during the holidays! Here you can see everything that is included in the gold flatware set. It looks so beautiful paired with the other gold accents on the table! I paired these affordable velvet-trimmed napkins with these beautiful gold and gray stone napkin rings. I used the trifle bowls again, this time to hold biscotti and some sweet treats! 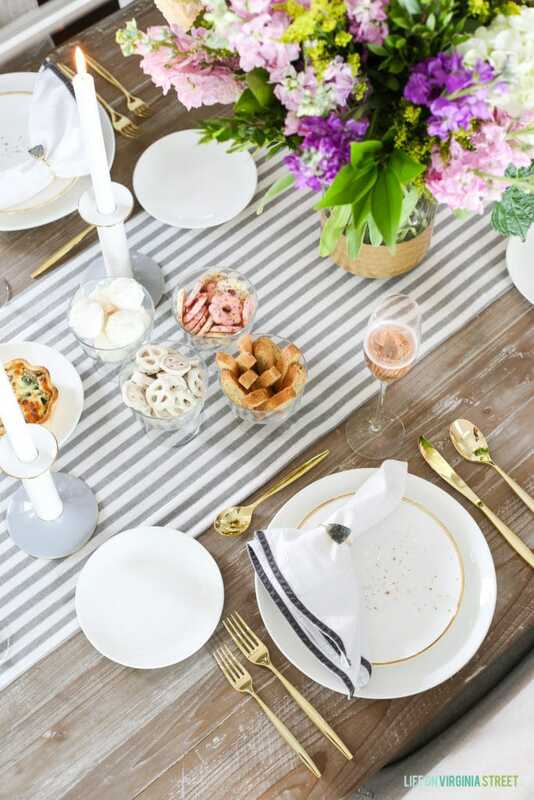 I love all the feminine details in this tablescape! I honestly can’t decide which tablescape I love more! I hope you enjoyed seeing various ways you can dress up or down this beautiful white dinnerware set! I love how versatile the items I purchased are, and look forward to scheming up even more ways to use them all in the future! Are you a white dish lover as well? Lastly, I wanted to mention one quick thing. Since I had so many dinnerware sets to order, I also decided to try the new Beyond+ program. Basically you pay $29 for an annual membership that gives you 20% off your entire purchase all year long, along with free shipping on online purchases. Basically like those coupons you get in the mail good on one item, but this is for your full purchase all the time! It was really easy to subscribe and use both online and in store the times I’ve used it. I wanted to mention the program in case there was anything you saw in today’s post that you know you want to buy. It may be worth getting the membership! Thank you again to Bed Bath & Beyond for sponsoring today’s post and inspiring me to finally get “real” dinnerware! Gorgeous table settings! We need to update our serving ware, so I definitely need to look into this line!